Did you know that there are certain spring cleaning tools can make your chore go much easier? You probably already know the saying, “If a job is worth doing it is worth doing properly”. The key to a good job is picking the right tools with which to do it. Much of the equipment needed to do a good spring cleaning job can actually be found in your home. There are many brand name goods on the market, each pledging to do a better job at cleaning, shining, disinfecting and deodorizing than rival products. You may not need any of those! Use our guide and find the spring cleaning tools that will do the job without breaking the bank! One tool no home should be without is a good vacuum cleaner. One with good suction and attachments is a blessing to any home. Not only do the carpets, rugs, and mats benefit from a good cleaning, but bed frames and mattresses alike can be vacuumed saving an old fashioned beating of the upholstery. With the right attachments, the vacuum cleaner will get into hard to reach places such as ceiling corners, cornice, lighting centerpieces, and other intricate or ornamental moldings. Stairwells can be reached safely and with less exertion. Cleaning of pipes, beams and all manner of nooks and crannies are achievable with the vacuum cleaner. Do not forget to refresh your cleaner often. Wash permanent bags and filters if it has them. Clean out the cylinder properly on a bag free vacuum. Even the ones with disposable bags need cleaning out thoroughly once in a while. A long reach feather or preferably fiber duster is a must during the inevitable yearly clear out. They are softer and therefore less damaging to the more delicate decorations than a vacuum cleaner. They are also great for getting into and around the curves in an open balustrade. Tops of doors can harbor dust and grime removable with a long reach duster. Picture frames and Venetian blinds wash better if dusted first. Long handled fiber dusters can make short work of dust and fluff which collects behind radiators, especially over the cold winter months when the heat attracts all manner of muck. A mop and bucket are essential to a good cleaning job. A mop and bucket (preferably with a string mop head) are excellent for not only washing a floor but, used properly with your choice of cleaning solution, can reach otherwise unreachable areas. A string mop reaches unobtainable pipework in bathrooms, kitchens and basement cellars alike. Use the mop as just a cleaning cloth on a stick. A dry mop makes a good job of buffing or even dusting areas too large for the duster. A bag of old cloths or rags (the more the better) is the fourth important tool. Old rags, dusters, or clothes cut into cloths are amazing because there is then no need to waste time by having to stop, wash, rinse, and dry cleaning cloths constantly. If using a corrosive cleaner, the cloth used can be disposed of properly and safely if it is not required for reuse. Plenty of clean ready-to-use cloths make washing, rinsing, cleaning, dusting, buffing, polishing, and shining a little less of an unpleasant task. And finally, rubber gloves. Not just for the saving of manicured nails, but also for protection against acidic or caustic cleaners. Even the mildest cleaning agent if used over a long period of time can irritate and even inflame the toughest of hands. The choice of glove must be left to the individual. Some skins may tolerate a cheap supermarket brand of protection, others may suffer latex allergies. Some may be happy with a neutral colored surgical style glove and some may prefer a pair of shocking pink gloves with furry cuffs. Either way, long term exposure to a mild washing liquid can be as damaging to the skin as short term exposure to something harsher. Spring cleaning is a huge but necessary job. Be sure you have these spring cleaning tools on hand to tackle the tough jobs around your home this season! 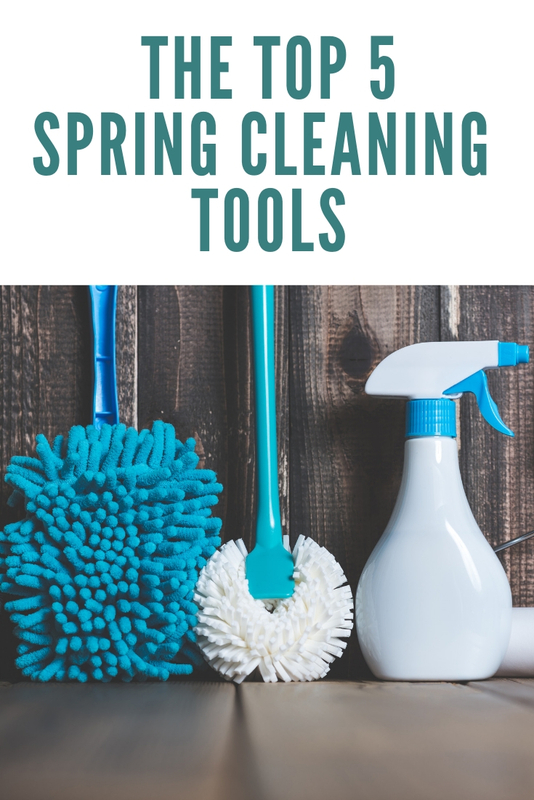 Love these spring cleaning tools and want more cleaning ideas? Try the links below!